With the Trump-Kim summit in Hanoi dominating news coverage and election campaigns in key regional states such as India, Indonesia and Thailand offering daily distractions, it is difficult to generate genuine interest in the continuing humanitarian and security crisis in and around Rakhine state in Myanmar. Officials from Saravan, Champassak, Xekong, and Attapeu provinces met in Saravan province on Wednesday to discuss cooperation with Cambodia and Vietnam in the Triangle Development Area. UNITED Overseas Bank (UOB) and OctoRocket.asia have signed a memorandum of understanding to enable small businesses in South-east Asia to quickly apply for financing through OctoRocket’s platform. High hopes: South Korean President Moon Jae-in (left), Singaporean Prime Minister Lee Hsien Loong (center) and Thai Prime Minister Prayut Chan-o-cha pose for a group photo before the start of the ASEAN-South Korea summit on the sidelines of the 33rd ASEAN summit in Singapore on Nov. 14, 2018. 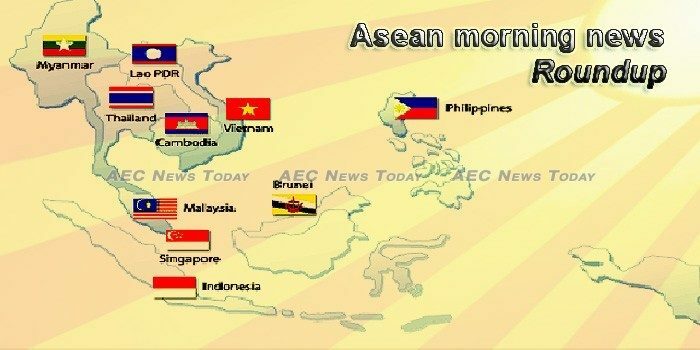 The 10 member-economies of Asean have made big strides in achieving financial stability since the Asian financial crisis 20 years ago. New political commitments to protect marine resources are expected to be announced in two key international marine meetings to be held in Bangkok next week, officials said Thursday. Myanmar’s Union Parliament yesterday approved an agreement on investment between the Association of Southeast Asian Nations (Asean) and China’s Hong Kong Special Administrative Region (SAR). Even with the challenging and uncertain external environment, Asean economies are standing pat on their domestic reflation policies, according to a flash note by DBS. The Mekong region is frequently affected by natural disasters associated with climate change such as floods, droughts and typhoons. Posts shared tens of thousands of times on Facebook contain images purporting to show children whose organs have been harvested in Southeast Asia. Beef producers in the 11-nation Trans-Pacific Partnership trade agreement enjoyed a surge in sales to Japan in January, as ranchers benefited from lower tariffs than their U.S. competitors. Portfolio managers and buy-side analysts give their verdicts on the region’s corporations. Cambodia’s Anti-Corruption Unit (ACU) has kicked off an investigation into the assets of one top-ranking police official in Kandal province as it winds down an inquiry into those of another in Mondolkiri, drawing praise Thursday from graft watchdogs who urged the government to probe further cases. Open Development Cambodia (ODC) has updated profile page on “Public transportation” under Access to public services by revising the 13 Phnom Penh city bus routes and 874 bus stops together with the information in both Khmer and English of distance, operating hour, and map. Nguyen Phu Trong, President of the Socialist Republic of Vietnam and General-Secretary of the Communist Party, paid an official state visit to Cambodia on February 25-26, in a move to further enhance bilateral relations with Cambodia. The State Enterprise (BUMN) Ministry here on Thursday held a coordinating meeting participated in by president directors of 154 state-owned enterprises. Indonesia’s 2019 presidential election is a face-off between two old rivals: incumbent President Joko Widodo (Jokowi) and his challenger Prabowo Subianto. Indonesia`s trade balance recorded a US$1.16 billion deficit in January 2019, up slightly from $1.03 billion the month earlier, a central bank`s official said. Laos is one of the fastest growing economies in Southeast Asia (SEA). On average the country’s economy as measured by GDP has grown by 7.5 per cent per year and trade by 17 per cent per year since 2000, reflecting the importance of trade as a key driver of its growth. The Samsung-Lao Tech Institute 2019 project will offer training in app development and basic Android programming skills to young Lao programmers and app enthusiasts. The recent revival of negotiations for the deferred multi-billion ringgit East Coast Rail Link (ECRL) project indicates Malaysia under the Pakatan Harapan (PH) government is still very keen to continue business with China, Ong Kian Ming said. The Singtel Group and Malaysia’s Axiata Digital have sealed an initial agreement in Spain to collaborate in the areas of mobile financial and digital services to support Asean’s efforts to grow the digital economy. Social investment in Myanmar has increased but there is still a need to further deployment of capital, the Singapore-based Asian Venture Philanthropy Network (AVPN) says. Bilateral border trade between Myanmar and Thailand between 1 October 2018 and 15 February 2019 totalled US$1.29 billion, with exports worth $ 926.9 million and imports worth $ 372.6 million, according to the official’s statistics issued by the Ministry of Commerce. Thailand’s military-appointed parliament on Thursday passed a controversial cybersecurity law that gives sweeping powers to state cyber agencies, despite concerns from businesses and activists over judicial oversight and potential abuse of power. Police on Thursday arrested five people for alleged involvement in the theft and sale of 11 brand-new handguns from the provincial police investigation unit. The strong baht is expected to affect the tourism industry as travellers may shift to other destinations in the region where local currencies have edged up at a slower pace, said a business leader. Experts from the Republic of Korea (RoK) have recommended Vietnam develop a high-speed railway network with the track gauge of 1,435mm. If the luxury tax on domestically made car parts is removed, production costs could be considerably lower and the low-cost car dreams would be within reach.